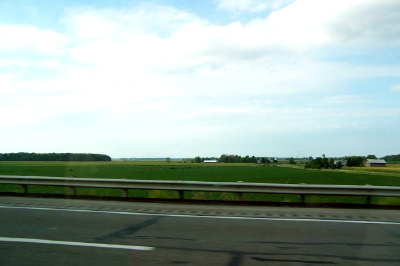 If I let my mind go, it will go all the way back to that field in Ohio where you lay, set off from the state road. A green-grassed space next to a farmer who realized the cemetery business is good, steady income, few hassles, a peaceful proposition. And even though I was there, I think we all missed the precise moment you slipped out the door, the smell of morning coffee and newsprint (which always made you sneeze) lingering. We didn’t spend enough time at the grave; it all went too quickly. Mom did all she could bear and ran into the safety of playing hostess. As the limousine pulled away from the cemetery, I looked back in panic. I couldn’t believe we were leaving you there…where you never wanted to be. But, part of me thinks you might enjoy all that quiet. The wind moving through the hemlocks and tops of distant trees and pastures. Maybe you enjoy the grey-bellied clouds that gather for summer storms, the wind showing the underside of leaves, thunder rolling into eternity, a staggered bolt of lightning meeting sky and flat earth. I want to know you are safe and happy. I want to know if you see the still beauty of graves covered in November’s first snow. I think of all the visits to cemeteries I endured as a child, looking at names and dates etched in stone, trying to imagine faces and lives of people I barely knew. It seems crazy you are there now, and I am here. I listen for you. Watch for you. I want you to be the moon following me home. The stranger that smiles. But mostly, I want you back. ← 25 is the new 55. Today I read one of your stories about “DAD” I didn’t cry this time. I tried to remember all the times I watched him take care of you and remembered all the soft, fuzzy times we had with him.